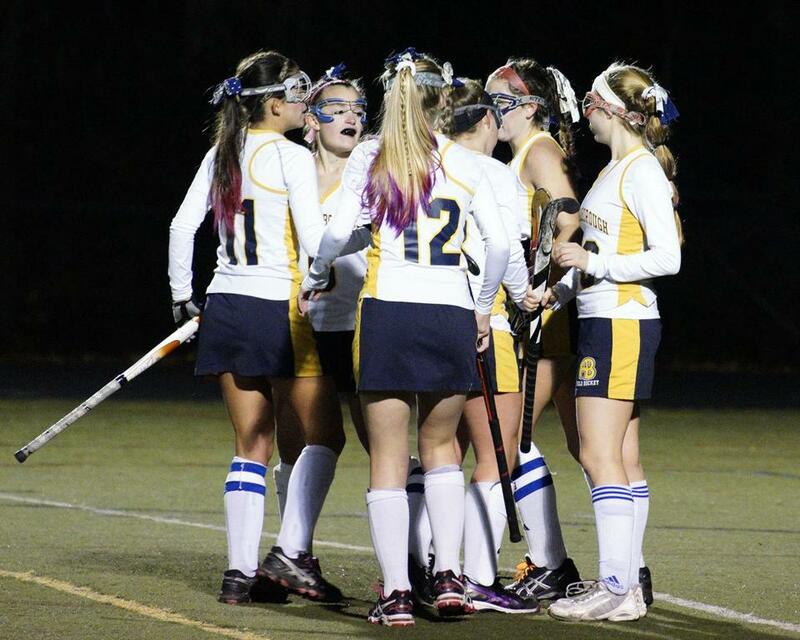 Acton-Boxboro field hockey has won 47 straight games — and counting. 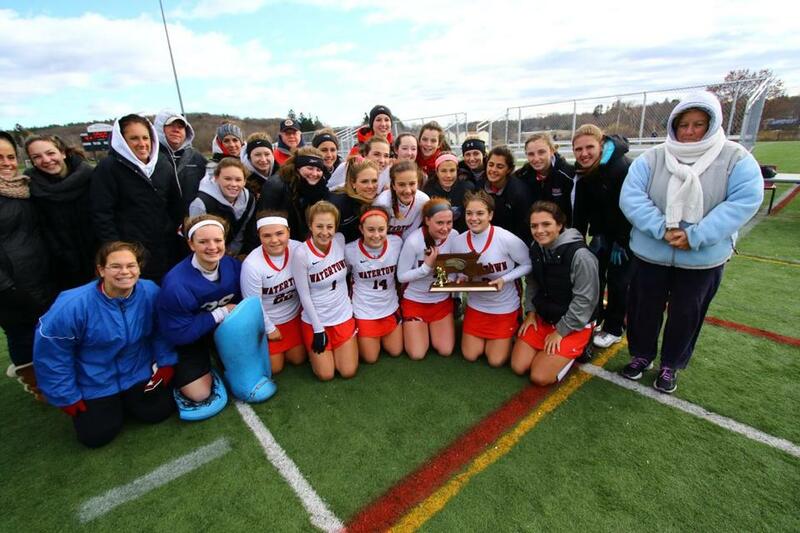 It’s easy to feel sorry for the Acton-Boxboro field hockey team, which is odd considering the Colonials have won back-to-back Division 1 state titles. Blame it on the boys. In 2014 the focus was on the D-Y boy goalkeeper and journalist types flocked to the state semis, not to see A-B, but to see if the boy in goal could beat A-B. And this fall, led by talented players like Meg Barrett and Emma Kearney, A-B won the North title but the headline was on the boy trying to stop Watertown’s streak. The Colonials won that day, and two more, including Longmeadow for the state title. And btw, there’s more than one team with an unbeaten streak. A-B’s is 47 and counting. For the record, Watertown’s national- record unbeaten streak is at 160. It’s been a few weeks since the end of the field hockey season so don’t feel bad if you’ve forgotten the number. For the record, Watertown’s national- record unbeaten streak is at 160. The Raiders broke the record of 153 in a 6-0 win over Melrose on Oct. 21 and went on to win their seventh straight Division 2 state title, finishing 22-0 while giving up just one goal all season. “I’m so proud of these girls, my coaches, and the community that supported us,” said coach Eileen Donahue. There’s another number to keep track of when the 2016 season begins. That’s 597, the number of career wins for Donahue. In the past two years there’s only been one person on planet Earth who has scored on Watertown. Introducing Lincoln-Sudbury junior Caroline Kenney. On Sept. 24, Kenney scored on a short corner with 0:00 on the clock in the first half of an eventual 7-1 loss to the Raiders. But who cares about the 7? Kenney’s goal wasn’t her first or her last, and she earned Dual County League field hockey honors this fall, proving the score was no fluke. She’s a two-year starter in field hockey and right about now she’s in the pool, competing for the defending Division 1 state champion swim team. She swam a 26.69 in the 50 free at states. Impressive, but not as much as that goal. 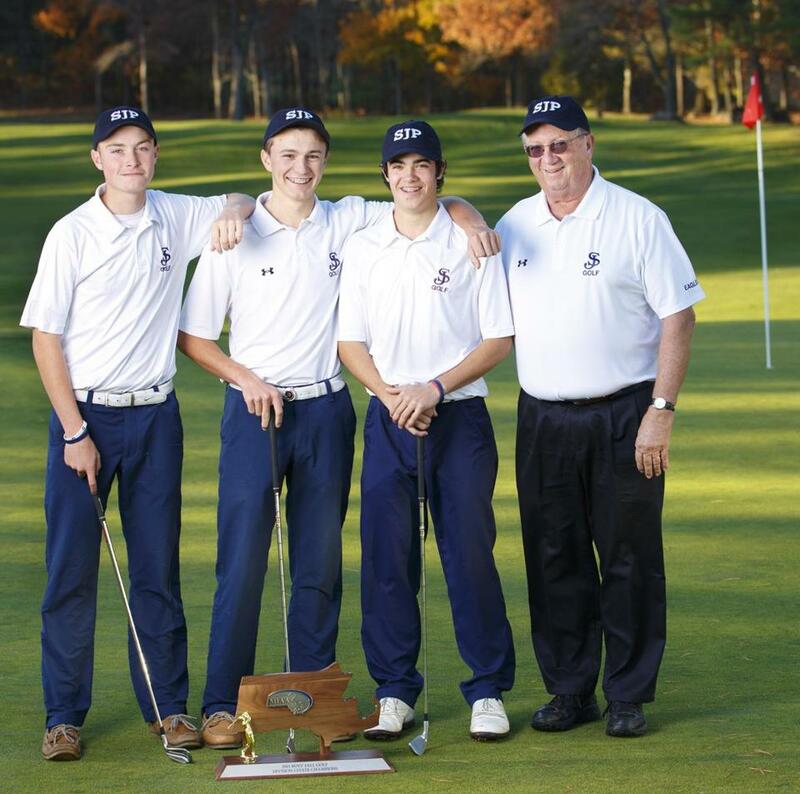 St. John’s Prep went undefeated on the golf course this fall. The St. John’s Prep golf team had a spectacular fall — 17-0 record, Catholic Conference title, North title, Division 1 state title — but to the average hacker (why you looking at me?) what junior Chris Francoeur accomplished one day in Salem stands out. Using a pitching wedge from 137 yards, Francouer took a memorable swing on the Salem Country Club’s third hole and watched the ball drop in for a hole-in-one. Teeing off on the next hole, teammate Jake Ewing said, “No way. Did he seriously just hit that?” Yes he did, one of many great shots in a season that concluded the career of coach Larry O’Neill after 27 seasons and 390 wins. If you want to go out in style, how’s this for a plan? 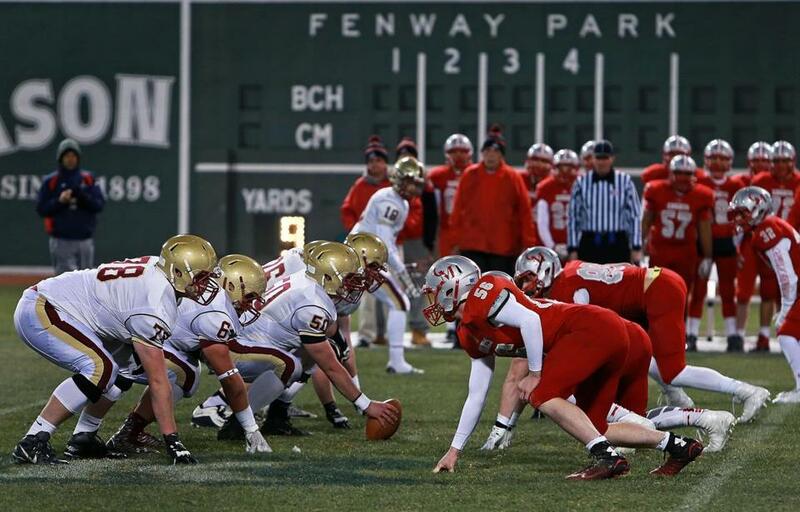 In your last regular-season game, play at Fenway Park in the first high school football games at Fenway since 1935. Then, in your last playoff game, the Division 1 Super Bowl, settle in at Gillette Stadium. Xaverian may have spent a lot of money on refurbishing their athletic facilities, but something tells me their Westwood home doesn’t compare to Fenway and Gillette. It also helps if you win on those special occasions, which the Hawks did to finish 12-0 and extend their win streak to 24. “We fought so hard this season – 24 straight wins – it doesn’t get better than that,” said senior Coby Tippett. A lot of time is spent each season recording wins and losses. But every fall Concord-Carlisle records a far more important number, the figure on a check they present to Dana Farber. In a state where many schools do their part with charitable events, the Patriots’ effort stands out. This September at the 9th annual Kicks for Cancer event, the day-long schedule of soccer games ended with the Patriots’ boys’ and girls’ soccer captains presenting a check of $44,940 to Dana Farber on the Friday before Thanksgiving. The 32 combined wins of the C-C boys’ and girls’ soccer teams is impressive. The amount raised in one day to defeat cancer, even more so. BC High topped Catholic Memorial, 13-10, the day before Thanksgiving. Admit it, the site of a goal post near home plate at Fenway Park was strange. And the one out where David Ortiz’ shot into the bullpen made history against the Tigers was a tight fit. But overall the 48 hours of high school football at Fenway was a complete success and there’s hope for more games there in the future. Roughly 27,000 fans watched as Xaverian, St. John’s Prep, Catholic Memorial, BC High, Boston Latin, Boston English, Needham, and Wellesley squared off in four games. Scores, while important, didn’t seem to matter as much. “A lot of legends are here. Just happy that I could step in the same footsteps as them,” said English lineman Joshua Ifebhor. None of the girls on the Needham soccer team were alive the last time the Rockets won an MIAA state title 30 years ago. But going into this season, despite the graduation of some talented seniors, Needham wanted only one thing, a state title. “Anthing less than a state title they weren’t going to be happy with,” said coach Carl Tarabelli. But it was smiles all around after Needham beat Algonquin, 3-1, in the state final. “We’re the only team that’s left standing,” said Tarabelli (Needham, class of ’78). And Nov. 21 was extra special for the Needham girls. The cross-country team also won the Division 1 title. The Andover girls had won their 15th state title and it was just a matter of moments before coach Marilyn Fitzgerald was given the ceremonial toss into the Harvard pool by her team. But the minutes passed and Fitzgerald was still dry. An oversight? Did the girls forget? No, they didn’t. When there was a delay in getting the results, Fitzgerald, with wisdom that comes from 24 years of coaching and concern from forgetting to bring a change of clothes, reminded her team that they’d miss the annual parade into town if they decided to dunk their coach. And did you notice that the Division 1 swimmers of the year are both freshmen? Here’s guessing Fitzgerald won’t stay dry next fall. 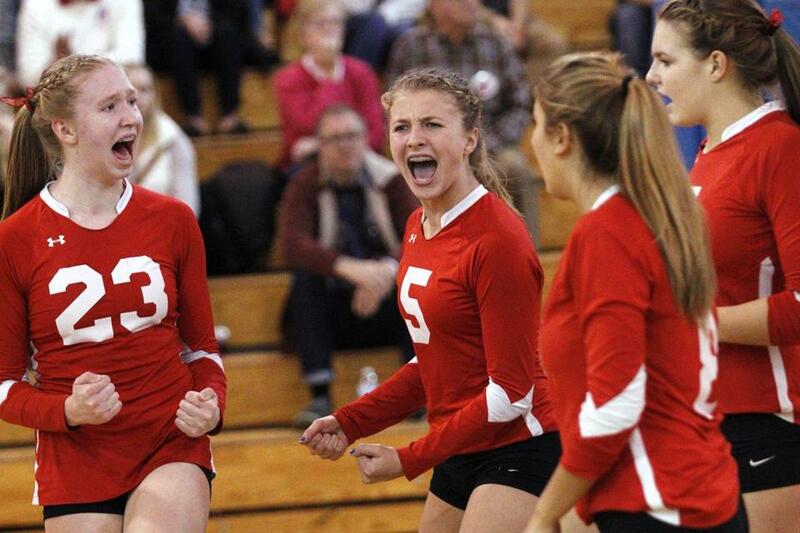 Barnstable earned its 17th state title this fall. The best thing that happened to the Red Raiders this fall was a loss to Andover on Oct. 6. OK, maybe not the best thing, but after losing to Andover, 3-2, their one and only loss of the year, Barnstable ran off 15 straight wins to earn their 17th state volleyball championship. And the fact the last win was a 3-0 victory over the same Andover team made it even more special. The first set took almost 45 minutes with Barnstable winning, 31-29. With the pressure off the Red Raiders and on Andover, the next two were far easier 25-16 and 25-15 wins. Coach Tom Turco said that after the October loss his team was on a mission. Credit a loss for the ultimate win.